There is still only limited information available on the 2014 Forester’s exterior, but we do have a few images to go off of and some dimensions. First of all, the front fascia receives a complete redesign, as the grille is replaced with a unit that boasts a floating-wing-like piece e that houses the Subaru emblem. The grille’s construction is all-new too, as its takes on a chicken-wire-like design. The entire front end takes on a bolder styling than last year’s model, which became rather soft, in our opinion. The center of the front bumper boasts a flat-black plastic panel that adds a utilitarian character to the Forester. To the outside edges of this panel are vertical air-intake vents that add even more character to the Forester’s face. 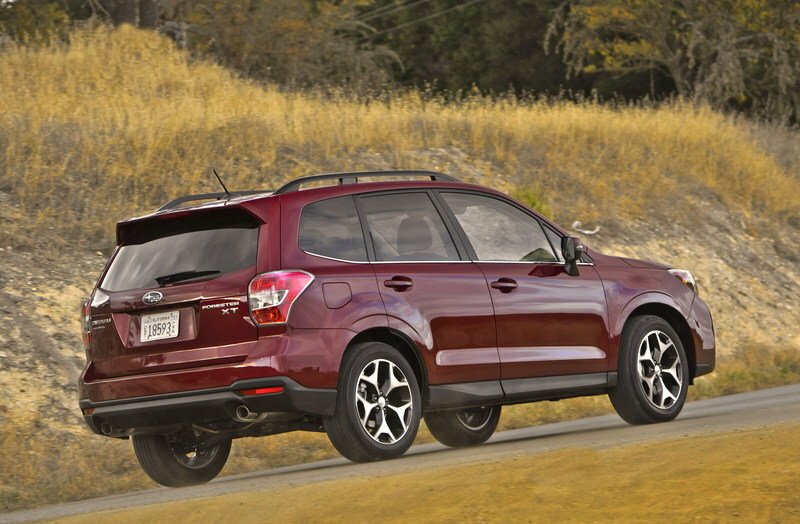 The Hood takes on a flatter plane, which also gives the Forester more muscular shoulders. The last revision that we can tell from the images that Subaru has released is the deletion of the soft, swooping headlights from 2012. 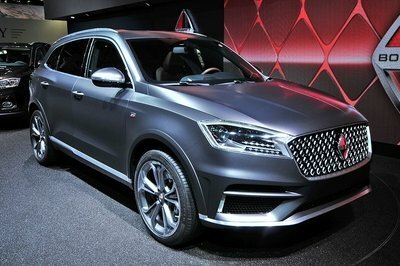 In their place are hard-angled headlights that give this crossover SUV a more-SUV-than-station-wagon look – something the Forrester lost over the years. In terms of size, the Forester did get a little bit bigger since last year. It comes in at 180.9 inches long, 68.2 inches tall (with roof rails) and 70.7 inches wide. That puts the 2013 model at 1.4 inches longer, 0.6 inches wider and 0.8 inches taller than the 2012 model year. It does retain the same 8.7 inches of ground clearance, which is plenty for any soccer mom turned adventurer. It also retains the 103-inch wheelbase that it had in 2012. Also changed up for the 2013 model year are the base-level rims, as replacing the 16-by-6.5-inch steel rims are 17-by-7-inch aluminum alloy wheels. 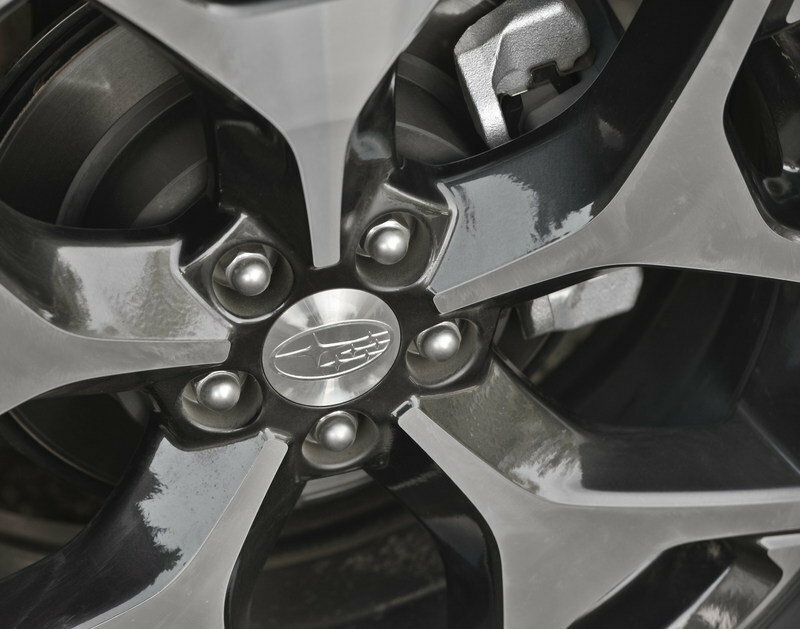 The 2013 Forester will also feature 18-by-7-inch aluminum alloy rims on models fitted with its new 2.0-liter engine. 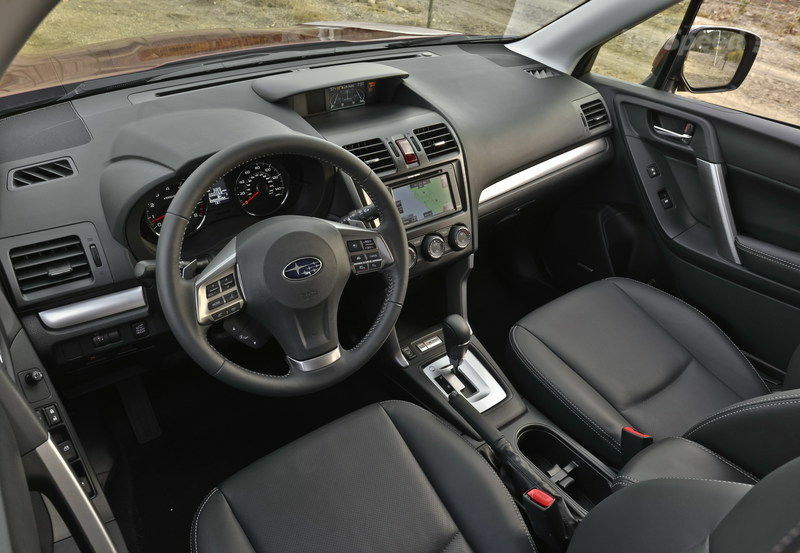 Subaru released almost nothing on the interior. All it said in its press release it that it will be exceptionally roomy with increases in rear legroom and in the cargo area – both are mostly due to the increased length. 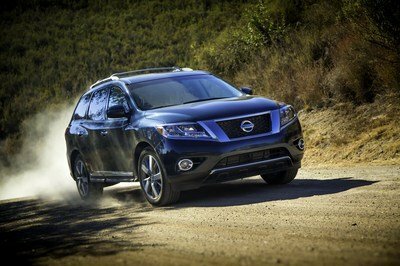 In terms of technology, the 2014 Forester will feature smartphone integration, navigation, rearview camera and a Harman/Kardon premium stereo system. 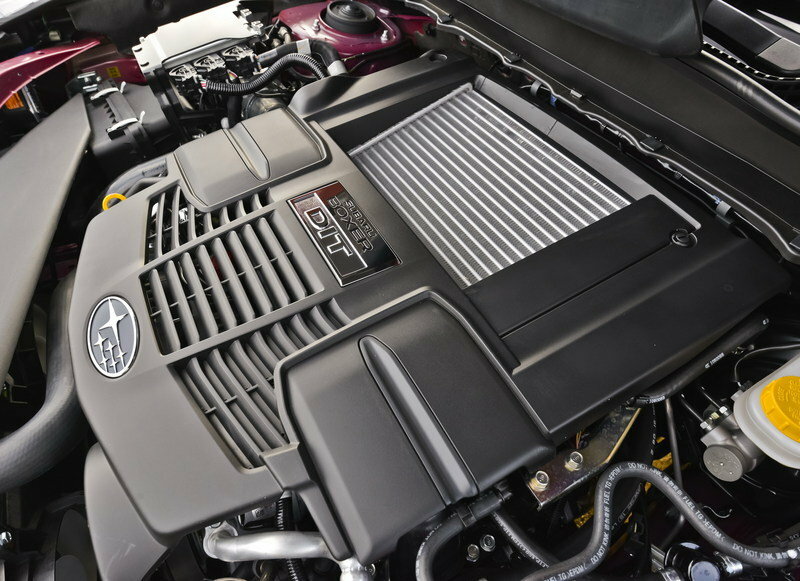 Under the hood of the base-level 2014 Forester is the all-too-familiar 2.5-liter, 4-cylinder boxer engine that the Forester has used for ages. This engine is a direct carryover from 2013, as it features the same 170-horsepower and 174-pound-feet rating it did from the previous year. This engine links up to either a 6-speed manual transmission or a CVT – the 4-speed automatic option is no longer available. The biggest mechanical change, next to Subaru replacing the 4-speed auto with a Lineartronic CVT, is the introduction of a higher-performance engine. This comes in the form of a turbocharged 2.0-liter 4-cylinder boxer engine that cranks out 250 horsepower at 5,600 rpm and 258 pound-feet of torque between 2,000 and 4,800 rpm. 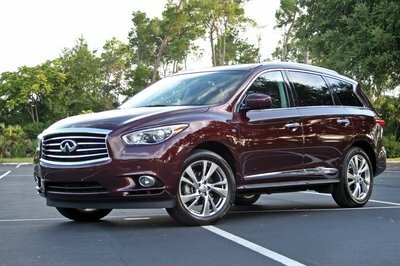 This is a 26-horsepower and 32-poundfeet increase over the 2013 model year’s turbocharged 2.5-liter engine. This turbocharged unit will connect to a high-torque CVT unit that features 6- and 8-speed manual modes, so it can be shifted manually. This combination will also feature Hill Descent Control to help keep the Forester in check while coasting down a steep hill. Subaru claims a fuel economy boost across the lineup, meaning its base engine should exceed 21 mpg city and 27 mpg highway, and its turbocharged model should exceed 19 mpg city and 24 mpg highway. 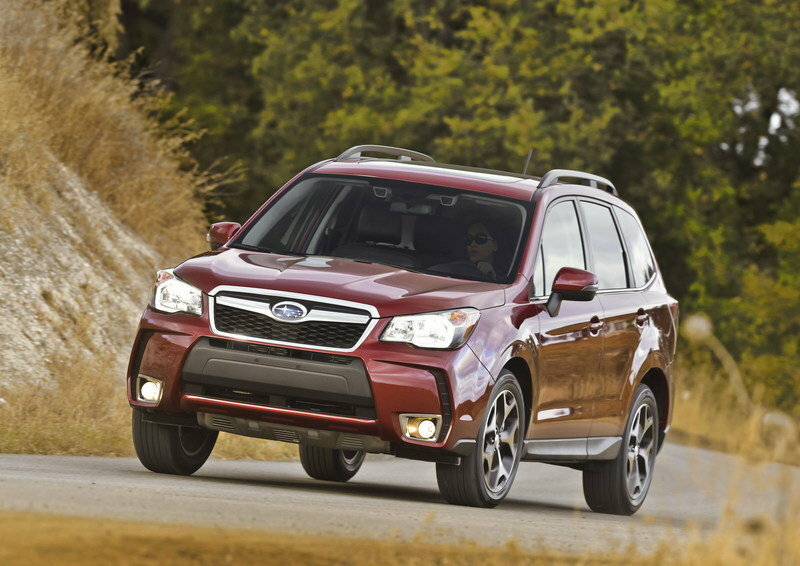 The only bit of information that Subaru released regarding the 2014 Forester’s handling and braking is its tire sizes. Wrapped around the rims on 2.5-liter-equipped models are 225/60R17 all-season tires and on the 2.0-liter-equipped models you get 225/55R18 all-season tires. We will update you when Subaru releases more information, but don’t expect anything too Earth shattering from its suspension. It is only a crossover SUV. There is no information on pricing just yet, but expect it to fall in line with the 2013 model year’s base price of $21,295. On the top end, however, expect to see it peak slightly higher than the current $29,005 price found on the 2.5XT Touring. It’ll likely fall closer to the $31K range. We are not too sure how the 2014 model year is going to shake out yet, so offering up a full list of competitors is impossible right now. 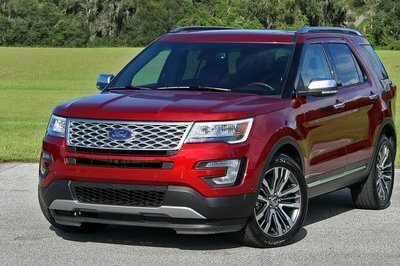 We can say that it will definitely meet resistance from the 2014 Honda CR-V and the 2014 Ford Escape. We will get into the competition once Ford and Honda start dropping information on their respective 2014 model year crossovers. Cherry Hill, N.J., - Subaru of America, Inc. today released the first official photos of the all-new 2014 Forester crossover SUV, which will make its North American debut at the Los Angeles Auto Show. The new Forester combines a bolder profile than before while offering a roomier interior with virtually the same footprint as the previous model. The fourth generation of Subaru’s popular Forester will offer a new 2.0-liter direct-injection turbocharged BOXER® engine producing 250 horsepower. The standard naturally aspirated 2.5-liter BOXER engine debuted in the outgoing Forester model. Fuel economy will be higher across the line with the debut of a new six-speed manual transmission and available Lineartronic® continuously variable transmissions (CVT). 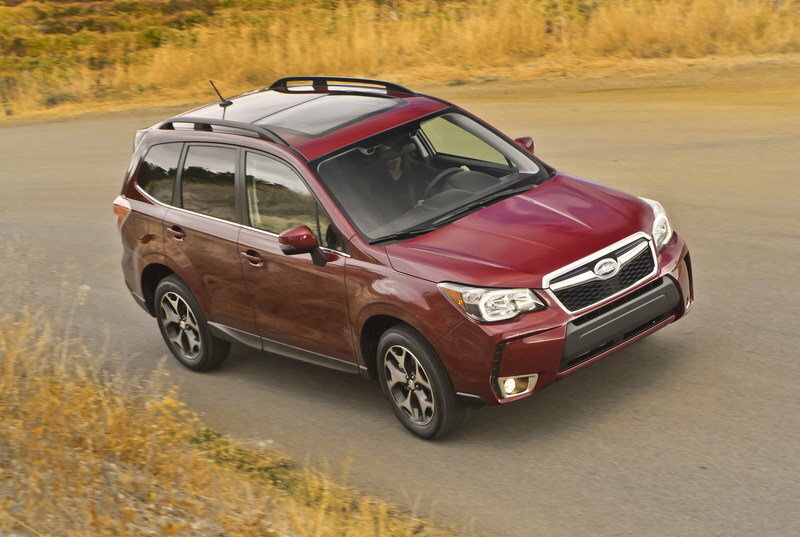 The all-new five-passenger 2014 Forester preserves the optimal blend of SUV capability and car-like ride and handling that have made the Forester one of the Subaru brand’s best-selling models for the past 15 years. Refined (or New) suspension system delivers agile handling and a highly compliant ride quality. Generous 8.7 inches of ground clearance enhances off-pavement driving capability. 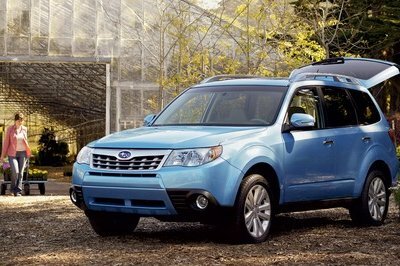 The 2014 Forester will offer an exceptionally roomy interior, featuring increased rear seat legroom, and an enlarged cargo area. In-demand infotainment features will be offered, including smartphone integration, navigation, rear view camera, and harman/kardon® premium audio amplifier and speakers. Subaru of America, Inc. is a wholly owned subsidiary of Fuji Heavy Industries Ltd. of Japan. Headquartered in Cherry Hill, N.J., the company markets and distributes Subaru Symmetrical All-Wheel Drive vehicles, parts and accessories through a network of more than 600 dealers across the United States. All Subaru products are manufactured in zero-landfill production plants and Subaru of Indiana Automotive Inc. is the only U.S. automobile production plant to be designated a backyard wildlife habitat by the National Wildlife Federation. For additional information visit http://www.subaru.com. “Subaru”, “BOXER”, “Forester”, all model names, and the Subaru logo are registered trademarks of the Subaru subsidiary of Fuji Heavy Industries, Ltd, Japan. Become fan of Subaru on http://www.facebook.com/subaruofamerica and follow @subaru_usa. Wow. That red SUV van is so fantastic. I think they just need to add more details of this car especially the highlights. Well if I were to ask about this Forester, I can say that this one is much better than the model way back in 1997.